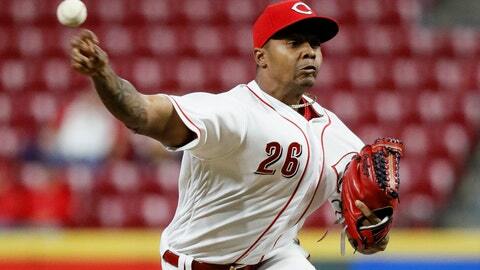 CINCINNATI (AP) — Reds closer Raisel Iglesias agreed Wednesday to a three-year contract guaranteeing $24,125,000, a deal that avoided arbitration. Iglesias reached a $27 million, seven-year agreement in 2014 that allowed him to void the remainder of the deal once he was eligible for salary arbitration. That agreement called for $5 million salaries in each of the next two seasons. He made $4.5 million this year, when he had a career-high 30 saves in 34 chances and a 2.38 ERA. Rather than having Iglesias eligible for arbitration each season, the Reds offered a restructured deal that gives both sides certainty. The Reds are trying to emerge from a massive rebuild that’s left them with three straight 90-loss seasons. Last year, they added setup men Jared Hughes and David Hernandez to the bullpen and got significant improvement. Their priority this offseason is to add a couple of veteran starters. They also hired David Bell as their manager in the offseason. Williams said Bell and his staff are looking at different ways to use Iglesias, who isn’t limited to a ninth-inning role like many other closers. Over the last three seasons, Iglesias has 24 saves of more than one inning, the most in the majors. “He’s appeared in crucial situations in the middle of games,” Williams said. “Obviously he’s done it as well as anybody at the end of the game.